French Coffee Press - Stainless Steel Coffee Maker 34oz, 1L.You can make one or eight cups of coffee at once, freshly brewed and right out of the pot. Its also very well made. The thick glass container is surrounded by a stainless steel frame. The kit comes with two extra filters which should last you a long time. The glass is heat resistant and with the combination of the thick glass and the steel frame, you do not worried about cracking or breakage. The spout is well designed and this is important as if you've ever dealt with a badly formed spout, it can be a mess. It also makes an easy tea.  Professional-grade THICK borosilicate glass which is durable and also heat.The high class stainless steel plunger and filter screen can be disassembled which helps you easy to cleanup.  Double-layer filter allows you to get a cup of coffee or tea in a few minutes, leaving the coarse coffee ground or tea leaves behind.  Perfect for all coffee and tea lovers. 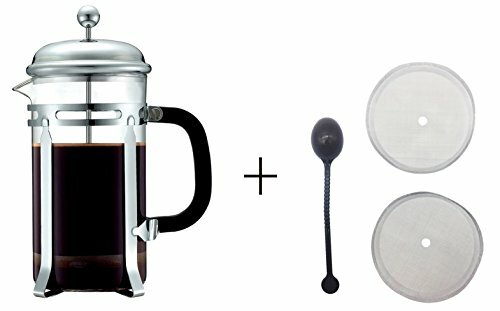  With a spoon for mixing coffee or tea, and two filters that can be replaced. If you have any questions about this product by Hey~life, contact us by completing and submitting the form below. If you are looking for a specif part number, please include it with your message.